Five minutes away from the center of the small and quiet village of Holbox, on the seashore, in the middle of a big tropical garden, you will find "VILLA LOS MAPACHES", a small resort of 4 wooden bungalows and 1 apartment, decorated in style and with an eye on ethnic detail. Privacy and personal attention are what make this place unique: you can relax watching the wildlife from your hammock, grill the fish you have just caught, or walk barefoot on white sands. Here, you can finally leave the hurry and anguish behind and rediscover that old-fashioned rhythm of life long forgotten. Romantic wooden bungalow, fully furnished near the beach. A big studio with 2 queen size bed, kitchenette, bathroom (hot- cold shower) and a nice porch with hammock overlooking the sea. Is a cozy wooden bungalow, in the middle of the garden near the beach. The studio is fully furnished with 2 queen size beds, kitchenette, bathroom (hot- cold shower) and the porch overlooking the tropical garden. Very nice and comfortable bungalow with 2 queen size beds, a full equipped kitchenette, a big bath room, and a veranda overlooking the garden and beach view. At 20 m.t from the beach, a little but very comfortable bungalow with a queen size bed, a refrigerator, and a nice bath room. In the garden rest- areas. Small studio 30 m2 for two people (extra bed possible), fully furnished with kitchenette, bathroom (hot / cold shower), 20m from the beach. Built on the beachfront and surrounded by a tropical garden, this cottage has a comfortable room and a living-dining room, a fully equipped kitchen and a "talavera" tiled hot and cold water bathroom. The house has a huge terrace facing the turquoise colored sea. More than 40 km of virgin beaches, clean air, abundant wildlife, Holbox is still one of the few places left where life continues at a slow pace with no worries of tomorrow. 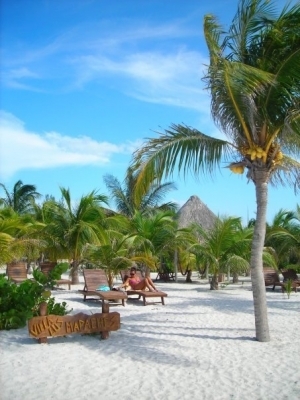 Situated within the protected fauna and flora area of Yum-Balam Park, in the heart of the Maya land, at the far north east of the Peninsula Yucatan, the island is a perfect spot for those who love nature and casual meetings with animals in their natural habitat or walking the streets made out of sand. A pirates refuge, it was turned into a small village in 1856 when it was found by a few European sailors, who were taken by the beauty of it's crystalline waters and decided to stay. Now, it has 1500 people living mainly from fishing and tourism (still as secondary activity). The streets are sandy, life is tranquil, hurry and stress are out, you can see the local ladies weaving their hammocks or you can visit the guitar and mandolin workshop of don Victor where talented kids make their own instruments.